Crispi is one of the World leading makers of parachuting and paragliding boots. Fans of these sports know what landing involves, especially with cold ankles or on rough ground. They consequently know what to demand of their flying boots. With removable ankle supports, patented by Crispi. Crispi is one of the World leading makers of parachuting and paragliding boots. Fans of these sports know what landing involves, especially with cold ankles or on rough ground. They consequently know what to demand of their 'flying boots'. 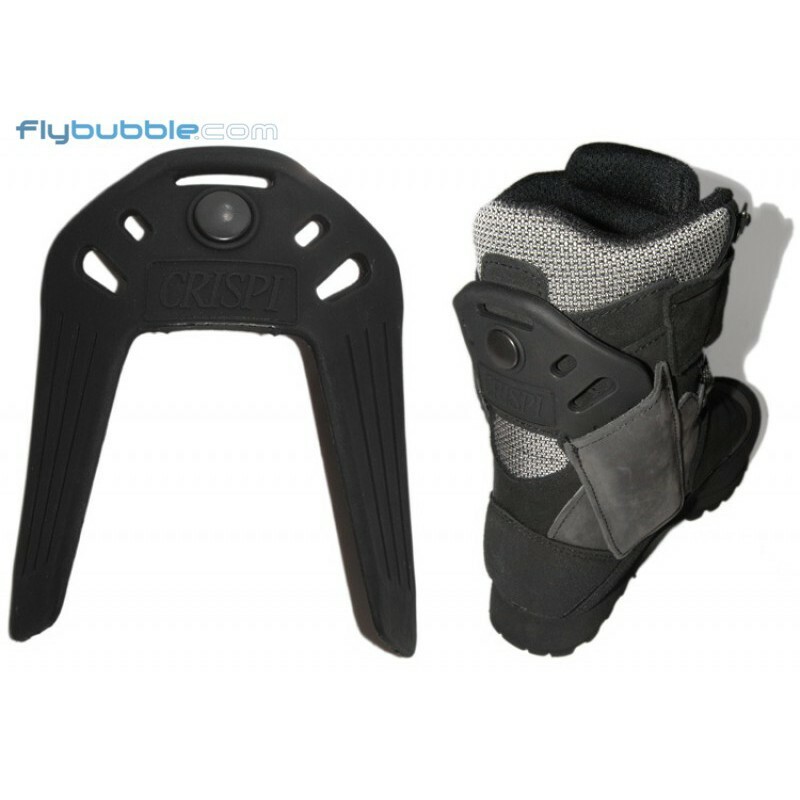 The Airborne model features an ankle protection system consisting of removable stiff shanks which support the ankle and help protect it from shocks, even violent ones, especially on landing. This solution, patented worldwide, ensures a level of safety that no trekking boots, no matter how rigid, can offer. Moreover, when the protection is removed the Airborne are excellent and comfortable mountain boots - as tested by John Shaw, who at the Red Bull X-Alps race hiked further than anyone else (66% of the total route). In-depth research into pilot's needs and the extensive tests performed have led to the development of an essential product which offers excellent protection from possible violent landing shocks thanks to the Vibram shock absorbent soles. The Gore-Tex HTG membrane, specially designed for more 'static' uses ensures the best thermal foot insulation at all altitudes without affecting breathability. "We are determined not to stop here and we will continue improving our products as we have always done, but today, in 2004, we can say with utter serenity that with the Paragliding-Parachuting collection, Crispi has fully reached the protection objectives we had set." Tomaia : Water Repellent Nabuk (see below). The "Nabuk effect" is the result of a very light polishing, adopted to give the leather a velvet effect referred to as Nabuk. *Sizes 48-50 made to order.